Part of the Sunday will be given over to a motions debate. 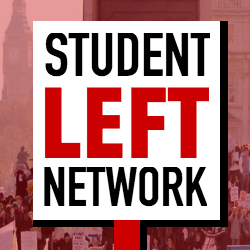 If you want the Student Left Network to campaign on a specific thing, think a central demand is missing from the Left Unity Charter, or want to change something about our constitution which sets out our democracy and how we operate, send your motion to studentleftnetwork@gmail.com by midnight on Sunday 24 February. Motions can be submitted either by an affiliated local or national group (find out how to affiliate your activist group, Labour Club or Young Greens society here), or by a group of at least seven members of the SLN. For the latter you should list the names of the seven members in the email with your motion. Motions can be in any format – either a block of text or a traditional ‘notes, believes, resolves’ format. The full list of submitted motions will be published on Monday 25 January and the deadline for amendments to motions will be Thursday 28 February. To come to the conference, show up at the University of Sheffield on Saturday 2 March. All supporters are welcome, just register for your place here and come along!